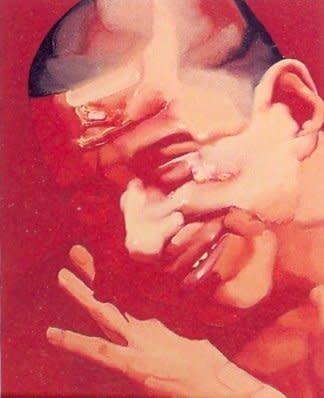 Yang Shaobin is renowned for his red-coloured portraits of grisly, eerie, deformed, or sinister creatures. His earlier works from the 1990s were mainly in the style of ‘Realism’, comprising groups of uniformed men who were fighting amongst each other in an explicit display of aggression and violence. Since 1998, his style began to depart from a realistic portrayal of the world around him to a more abstract approach to figurative art, focusing on the process of painting and creating, rather than just the final outcome. 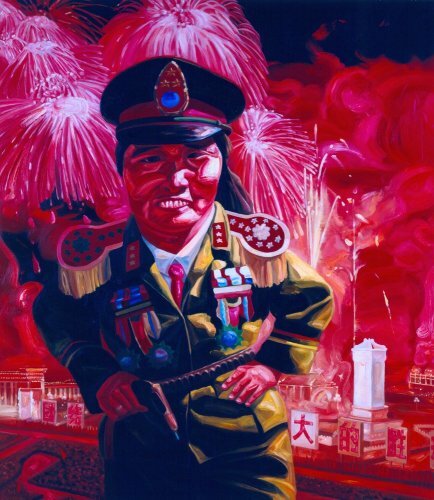 He gained worldwide attention with his Red Violence series, red-hued oil portraits that were exhibited at the Venice Biennale in 1999. These works focus on the depressing banality and brutality of the times in China, showing the artist’s reflections and critical thinking about the existing social order, the situation of the common people and the human spirit, as well as reflecting on the cultural discourse prevalent at that time. In this series Yang Shaobin’s artistic language, technical skill, and thematic vision took full form. The artist’s intention is for the viewer to feel pain in his work. He uses wide paintbrushes to paint with speed and agility, making use of the unbridled fluidity of diluted oil paint. The contrasting effect of red and white colours is used to display the tension of confrontation.